Jason McKibben - jmckibben@poststar.com Burch Family Restaurant manager Laura Burch, right, and former classmate Sarah Loscalzo, who last saw one another when they were fourth graders, are surprised to recognize each other at the restaurant in Fort Ann Tuesday, August 9, 2011. Laura's family also runs the Burch Family Farm and, in addition to running a catering operation, recently opened the restaurant which capitalizes on the growing locavore movement by serving the pork and beefalo they raise just a few miles away. Jason McKibben - jmckibben@poststar.com Burch Family Restaurant manager Laura Burch, left, sits down to chat with former classmate Sarah Loscalzo, center, and her friend Paul Barber at the restaurant in Fort Ann Tuesday, August 9, 2011. Laura's family also runs the Burch Family Farm and, in addition to running a catering operation, recently opened the restaurant which capitalizes on the growing locavore movement by serving the pork and beefalo they raise just a few miles away. Jason McKibben - jmckibben@poststar.com Some of the Burch family's beefalo herd are seen in a pasture on Mud Street in Kingsbury Tuesday, August 9, 2011. Jason McKibben - jmckibben@poststar.com A variety of Burch Family Farms barbecue sauces and salsas are for sale at the family's diner in Fort Ann Tuesday, August 9, 2011. FORT ANN - Laura Burch doesn't just serve the food at the Burch Family Restaurant, she births it, feeds it and slaughters it, too. The Burches have been farming in Washington County for at least five generations. The continually rising costs of operating the 350-acre Burch Family Farm in Fort Ann, including diesel fuel and labor, combined with low profit margins on their meat, led the Burches to just one conclusion to save their livelihoods: open a restaurant and sell their products to hungry patrons. 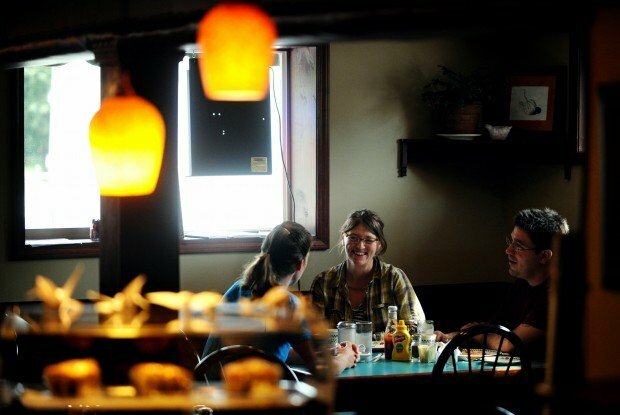 "It was about trying to make enough money to keep the farm going," said restaurant owner and Laura's mother, Lucy Burch. "The idea is, we raise the pig, the cow or the beefalo and then it goes directly to the plate." Less than four miles away, a small herd of about 50 of the Burch's beefalo roam in a field. Some 40 sows and 100 grass-fed beef cattle also enjoy substantial space in nearby pastures. Burch said they've paid increasing attention to what their livestock eats throughout the years, especially as members of her family have been stricken with cancer and other diseases. "We started growing all of our own food because we thought our health issues were related to what we eat," she said. Numerous studies have found commonly used hormones and pesticides to be carcinogenic. The Burches have hosted pig roasts for years, often catering weddings or graduation parties. But in June, they took the next step and purchased a building on Route 4 in Fort Ann. Open daily for breakfast and lunch, the Burches cook and serve pork, beef and beefalo (buffalo-cattle hybrids), along with chicken, eggs and vegetables produced by farms throughout Washington County. The short jaunt to the Argyle slaughterhouse is the longest trip the meat takes, either in life or death. Farmers have tried to increase profit margins for years, using farmers markets and "buy local" campaigns. But costs have kept rising and Lucy Burch believes something like her restaurant could be a viable concept as small farms look to diversify. "Maybe something like this is part of this ‘go small' revolution," Burch said. "It's hit and miss. Everybody's trying different things." "The physical lifestyle is rewarding," Laura Burch said. "You feel like you've accomplished something at the end of the day." And in the end, it's that lifestyle which Lucy Burch hopes her new venture can sustain. "We hope that at least some of our children will continue on with farming," she said. "It's the rebirth in the spring, the smell of the dirt that captures you." It means their farm is poorly kept and an eye sore. Nothing has ever succeeded at that location, so I hope they break the cycle. A lot of traffic going through to VT too.In fact, it seems NO restaurant lasts in Ft. Anne, why is that? I think the title of this article would be a good name for the restaurant...."pasture to plate"! Try their BBQ sauce and home-made relishes. As with their food, their other products are just great. I hope they have great success. They deserve it. Ok, building on route 4? Where? Is it the old portage restaurant across from the bank? Would have been nice if the post star had made reference to the exact location. Quality reporting! Thanks goodness Fort Ann is small, so it shouldn't be that hard to find, for somebody that lives there. If it is where I think it is, I certainly hope they fare better than previous tennants. I give them my blessings! Yeah right, you all should take a drive past their farm. Farmers' markets? There are plenty around here. Go check 'em. This is a GREAT idea. I’d much rather eat locally grown and raised foods, it’s healthier and it helps supports my neighbors. I’d like this concept to go another step further by offering local meats & poultry to be offered in our local markets for us to buy as an alternative. There’s already way too many additives, drugs, antibiotics, growth hormones and other impurities in the food chain from the large corporate suppliers which can cause preventable diseases. Local food producers can control and monitor how and what food is produced much better and healthier in my opinion. I’d even be willing to bay a bit more for this option and I’d bet that others would as well. Good food is an essential to a healthy and long life. Maybe NYS can once again turn to and support local agriculture and meat products to help local farms stay in business and, dare I say flourish? Would be nice. It is a shame that small farms keep going out of business! Is good to see at least one surviving by changing with the times.